Initiated and led by International Potato Center (CIP) scientist Dr Jan Low, the success of vitamin A rich Orange Fleshed Sweet Potato (OFSP) exemplifies how a CGIAR science-based approach can benefit millions of smallholder farmers and consumers. On the basis of rigorous nutrition, efficacy and effectiveness studies, OFSP was able to attract initial support that it could translate into progress at scale. Through CIP technical support, NARS in Africa has developed and released over 60 locally adapted OFSP varieties, and a pluralistic extension and delivery strategy has brought these varieties to more than 4.5 million households over the past 10 years. Importantly, an Integrated ‘Agriculture-Nutrition-Marketing Approach’ has nurtured both demand and supply and has built the capacity of a wide range of partners to reach vulnerable populations with OFSP. Combining methods from biological and social sciences, this approach is at the heart of the continued effort to improve OFSP varieties to meet farmer and consumer preferences, diversify utilization, and deepen impacts on nutrition and livelihoods. Adapting this approach to different contexts in 20 countries in Africa and Asia will require continued innovation to develop scalable, cost-effective OFSP delivery systems that harness the capacity and interests of a wide range of partners from public and private sectors. Just over 100g of Orange Fleshed Sweet Potato can cover the daily vitamin A needs of a 5-year-old ‘…’. We now also see increased demand in the food industry for biofortified sweet potato as a nutritious ingredient. That can be another huge step forward for farmers and consumers. Research conducted by CIP and RTB. As many as 1.8 million people in Nigeria have escaped poverty after adopting improved varieties of cassava, a new impact studyi has estimated. DNA-fingerprinted adoption data from a survey on a large sample of representative cassava-growing areas of Nigeria revealed that the improved varieties have been adopted by about 66% of cassava growers in the country, corresponding to 3.1 million households. Adoption of the new varieties is associated with an 82% increase in yields for growers. Agriculture is highly dependent upon the climate. Changes in the frequency and severity of droughts and floods pose challenges for farmers and threaten food security, and unpredictable, shifting weather patterns and extreme weather events can harm crops and reduce yields. 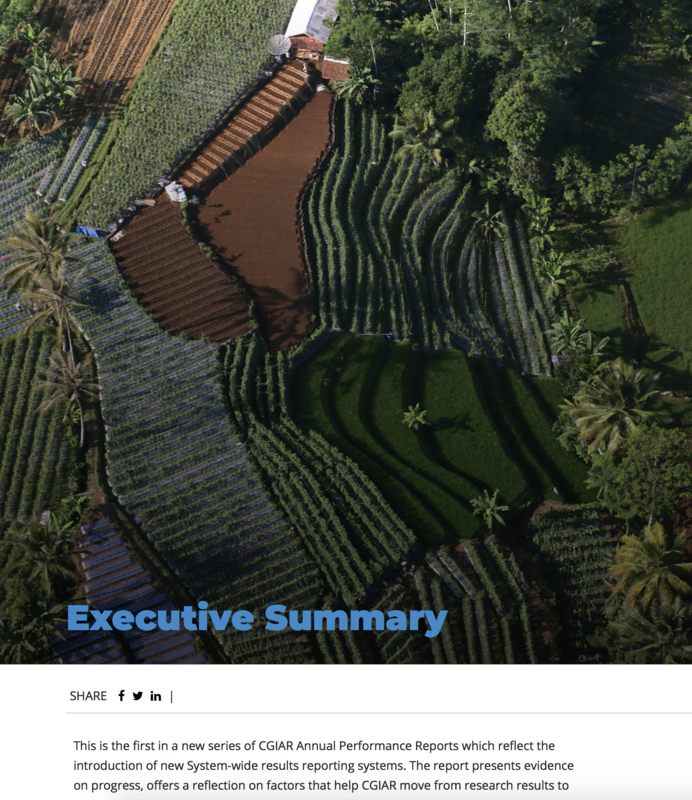 A partnership between the International Center for Tropical Agriculture (CIAT), the CGIAR Research Program on Climate, Agriculture and Food Security (CCAFS) and more than 10 partners led to the development of a suite of ICT tools and applications. These tools enable technicians from farmer organizations to collect, analyze, and deliver information that allows farmers to understand variations in seasonal climate conditions, and adjust their management practices accordingly. Guided by this information, farmers now know whether to plant, when to plant and which specific crops or crop varieties to plant. In addition, they have site-specific information on how much water and agrochemicals to use. This increases agricultural productivity, food and income security, and allows for more sustainable farming. In recognition of the impact this tool has had in helping farmers in Colombia and Honduras to make climate smart decisions, this project was awarded a UNFCCC Momentum for Change award in 2017. Since 2012, the Transform Nutrition consortium of five international research and development partners, has strengthened the nutrition evidence base, focusing on the 1,000-day period from conception to a child’s second birthday, when interventions to reduce undernutrition are most effective. The consortium has generated over 90 peer-reviewed journal articles; approximately 150 briefs, blogs, and newsletters targeting relevant audiences; and over 1,500 citations, influencing program and policy decisions in its focus countries and helping shape regional and global dialogue. In Ethiopia for example, policymakers, informed by evidence from Transform Nutrition, redesigned the Productive Safety Net Program to include specific nutrition elements to increase the program’s potential to improve maternal and child nutrition. Women in the program now receive work credits to attend nutrition education workshops on topics including what is a balanced diet and how to prepare healthy foods. Many governments intervene in agricultural markets. The reasons for doing so vary: to keep food prices low for consumers, to support farm incomes, to reduce price volatility, or simply to respond to politically powerful interest groups. Policy interventions can have unforeseen consequences. Measuring the impact of incentives helps governments make necessary policy adjustments and provides information on changes in global markets. Several international organizations have been monitoring agricultural incentives for many countries and commodities on a regular basis. Without coordination, however, these groups have been using incompatible measures. To address these issues, a group of leading international organizations active in this field (Organisation for Economic Co-operation and Development (OECD), FAO, Inter-American Development Bank (IADB) and the World Bank) joined with IFPRI and PIM to form the Agricultural Incentives Consortium (Ag-Incentives); the web portal for this initiative was launched in 2017. The database provides various stakeholders, including journalists, academics, policy makers, and NGOs, access to key indicators on agricultural policies in a user-friendly way. The global cocoa economy depends on genetic diversity – to breed improved varieties and adapt to changes in climate, new pests and diseases. In an effort to improve the livelihoods of nearly 6 million cocoa farmers across Africa, Asia and Latin America who produce 90% of cocoa worldwide, the Global Network on Cacao Genetic Resources Conservation and Use (CacaoNet) brings together national and international players from public and private sectors. cocoa industry associations, development organizations, research institutes, cocoa producer and producing country organizations, and impact investors. Results so far include the drawing up of a Global Strategy for the Conservation and Use of Cacao Genetic Diversity;iicommitment from the industry to fund two international cocoa ex situ collections, in Costa Rica and in Trinidad and Tobago; guidelines to reduce the risk of pests and diseases spreading between countries and regions; and marketing opportunities through the Cocoa of Excellence Programme (CoEx) platform. Spearheaded by Bioversity International and organizer of the Salon du Chocolat in Paris, Event International, CoEx runs the biennial International Cocoa Awards (ICA), a global competition recognizing the work of cocoa farmers and celebrating the diversity of cocoa. It selects the 50 best cocoa samples, with the ICA winners made into chocolate. An international effort coordinated by WHEAT resulted in the release in Bangladesh in 2017 of a high-yielding wheat variety with resistance to wheat blast, a deadly fungal disease from South America that appeared in Bangladesh in 2016 and threatens wheat crops on as much as 7 million hectares in South Asia. Called BARI Gom 33, the variety stems from collaboration by scientists of Bangladesh, Bolivia, the United States and International Maize and Wheat Improvement Center (CIMMYT), and its grain contains the added benefit of high zinc content. Rapid multiplication and promotion of BARI Gom 33 seed is underway to protect wheat crops and slow the spread of wheat blast in South Asia. The variety is also being tested for use in India and Bhutan. Another blast resistant variety from this research, Borlaug 100, was released in 2016 in Bolivia, where it has shown good yields and blast resistance. Performance of this variety in Bangladesh has also been encouraging and it may be released there soon. With support from Governments of Bolivia and Bangladesh, as well as the Australian Centre for International Agricultural Research (ACIAR), Indian Council of Agricultural Research (ICAR), USAID and CRP WHEAT, wheat blast phenotyping platforms were set up in Bolivia and Bangladesh; partners there are screening breeding lines from South Asia, South America, and CIMMYT. Fisheries and aquaculture contribute to the livelihoods of 800 million people and provide 3.2 billion people with 20% of their animal protein requirements. But to meet future demand for fish, particularly in developing countries, production will need to double by 2030. A range of multi-stakeholder partnerships forged by FISH is helping to address this challenge.iii For example, in November 2017, 22 researchers from 16 public and private institutions came together to develop the FISH research program’s agenda on tilapia health. Tilapia is one of the world’s most important farmed fish species. Partners include global leaders in fish health research (Cefas UK; CSIRO Australia; Norwegian Veterinary Institute; University of Stirling UK; Roslin Institution, UK; Exeter University, UK); experienced private sector companies interested in investing in developing and commercializing aquatic animal health management tools (MSD Singapore, FVG Thailand); national authorities and civil society organizations. The world’s groundwater reserves are increasingly threatened by human pollution, climate change and overpumping to supply irrigation, industry, and urban development. An international partnership is working to advance the sustainable management of this critical resource. About 96% of all the planet’s liquid freshwater is groundwater, which supports global food security, contributes to public health, and is a crucial factor in economic growth. The abstraction of groundwater has increased dramatically since the mid-20th century, jeopardizing supplies for current and future generations – and their food security as a result. The scale of the decline in the Earth’s groundwater reserves is so severe that it can be observed by satellites. The Groundwater Solutions Initiative for Policy and Practice (GRIPP), led by the International Water Management Institute (IWMI), WLE and PIM aims to strengthen, expand and connect current groundwater initiatives to share practical solutions. GRIPP promotes and adapts tested technologies and innovative policy and institutional approaches to connected management of surface water and groundwater resources. The network now comprises 29 academic and non-academic partners, promoting sustainable groundwater use from local to global scales. Key partners include CGIAR and other research organizations, professional associations, leading UN entities, geological surveys, NGOs and private sector enterprises. Research conducted by IWMI, WLE and PIM. In 2017, following in-depth research on challenges and opportunities for mechanization in the four countries, IFPRI, CIMMYT, and the Ethiopian Agricultural Mechanization Forum convened an international workshop to share lessons across several African and Asian countries. The event brought together more than one hundred participants, including researchers, policy makers, Funders, and implementing agencies. Among the topics discussed were private sector involvement in mechanization, the role of credit and subsidies, and the linkages between mechanization and employment. The conference contributed to disseminating policy research results and encouraging dialogue and networking among countries. Some early outcomes on policies and regulations have already occurred, e.g. in the new phase of the Agricultural Mechanization Services Enterprise Centers in Ghana. The formation of Agricultural Mechanization Forums has already enabled longer term South-South learning and support to take place among countries. Direct-seeded rice enables rice to be planted more rapidly and easily and with less labor. It consumes less irrigation water, is more conducive to mechanization, and produces fewer methane emissions. Rice seeded this way also matures earlier, which can allow an additional crop to be planted. However, many Asian countries have yet to make the transition to direct-seeded rice, continuing to use transplanting. A new private sector consortium led by the International Rice Research Institute (IRRI) is helping to improve direct-seeded rice technologies and encourage their adoption throughout South and Southeast Asia. The Direct-Seeded Rice Consortium will focus on improving mechanized and precise direct-seeding practices to help farmers draw the maximum benefits from this technology and overcome the challenge of competition from weeds. A solar-powered milk cooling kit is helping small-scale dairy farmers reduce wastage and generate higher incomes, thanks to a public-private partnership between German solar technology company Phaesun GmbH and LIVESTOCK. The kit consists of milk cans wrapped in reusable insulation and a compartment for ice to cool and store milk, keeping milk safe for six hours or overnight. The ice is produced by a solar powered smart ice-maker that works totally off grid with a battery life of up to four days, providing a low-cost and sustainable refrigeration solution for small dairy farms. Phaesun GmbH joined a Deutsche Gesellschaft fur Internationale Zusammenarbeit (GIZ)-funded partnership and worked together with researchers from the University of Hohenheim, who developed the initial prototype. The cooling kit was tested and modified with dairy farmers in Tunisia in collaboration with the Tunisian research institute INRAT and ICARDA. Phaesun has since developed and is marketing a commercial version of the cooling kit called the BOSS Kit Milky Way, providing the means to scale out the technology. 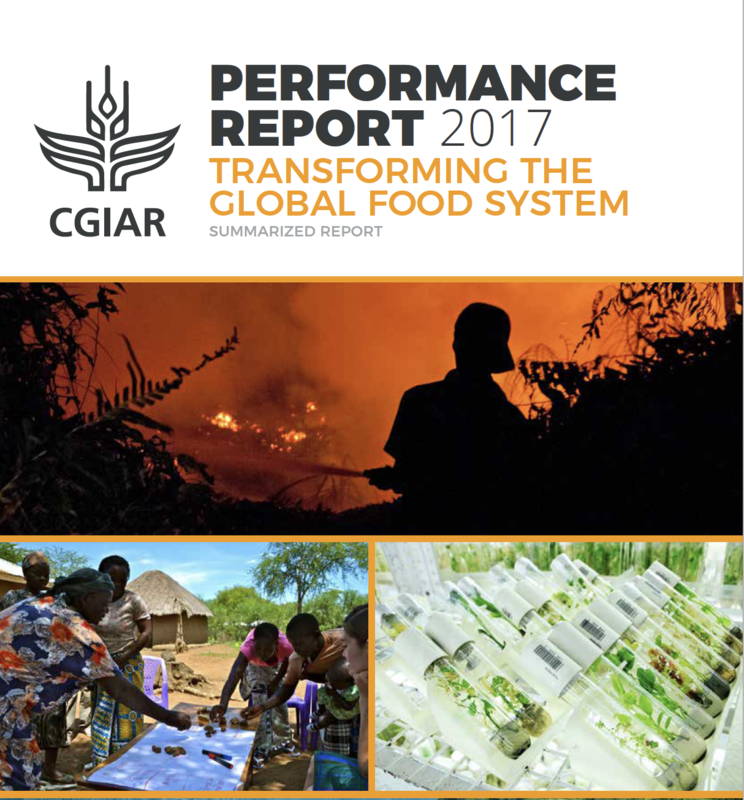 In 2017, more than 7,000 participants from 44 countries joined the 500-plus capacity development events hosted by the CGIAR Genebank Platform. The genebanks received a large number of visitors and conducted more than 400 tours to highlight the importance of crop diversity and the CGIAR’s work on genetic resources. The high demand for engagement with the genebanks reflects their growing reputation as national, regional and global knowledge hubs for the crops they conserve. Researchers around the world benefit from the unique expertise of genebank staff in the taxonomy and diversity of specific crops and increasingly from the data made available online in Genesys (www.genesys-pgr.org) and other websites. i SPIA, “What Is the True Impact of Improved Cassava Varieties in Nigeria?,” Brief (Rome, Italy: Independent Science and Partnership Council, 2018). ii CacaoNet and B. Laliberté, “A Global Strategy for the Conservation and Use of Cacao Genetic Resources, as the Foundation for a Sustainable Cocoa Economy” (Montpellier, France: Bioversity International, 2012). iii C.V. Mohan and R. Subasinghe, “FISH: CGIAR Research Program on Fish Agri-Food Systems: Tilapia Health Research 2017–2022: Priorities and Partnerships,” Program Report (Penang, Malaysia: CGIAR Research Program on Fish Agri-Food Systems), accessed September 9, 2018, https://fish.cgiar.org/publications/tilapia-health-research-2017-2022-priorities-and-partnerships. iv A.T. Animaw et al., “Agricultural Mechanization and South-South Knowledge Exchange: What Can Ethiopian and Kenyan Policymakers Learn from Bangladesh’s Experience? | IFPRI,” ESSP Research Note (Washington, D.C. and Addis Ababa, Ethiopia: International Food Policy Research Institute (IFPRI) and Ethiopian Development Research Institute (EDRI), 2016), http://www.ifpri.org/publication/agricultural-mechanization-and-south-south-knowledge-exchange-what-can-ethiopian-and.